If you’re an eBay enthusiast, either for buying or selling, there’s an updated Android app for you to download from the Google Play store. Version 2.7 brings a “fresh new look” that seems to have taken at least a few visual cues from Google’s Material Design playbook. The new aesthetic is clean and flat, with a predominantly white color scheme and minimal shadows. The home screen offers a search bar and a shortcut to your basket, as well as an easy way to review followed sellers, searches and a personalized feed of items. 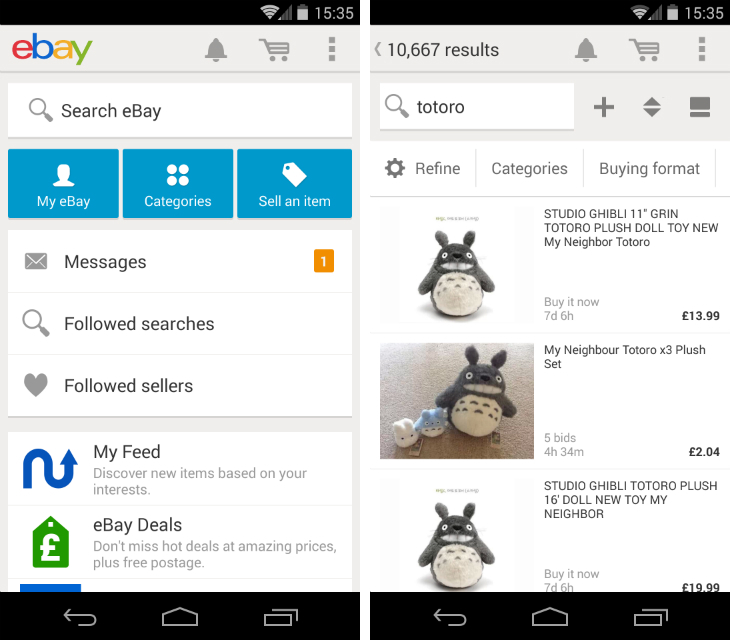 eBay has made images larger and revamped how it displays search results, which should make finding the perfect item just that little bit faster. In-app notifications have been introduced and it’s also possible to donate to your preferred charity when putting items up for sale. Finally, the app now lets you check a seller’s location when reviewing a “Best Offer” and also send payment reminders. Thumbnail image credit: eBay Inc.